I am the Queen of Someday. The Princess of Procrastination. After all, why do today what can be put off until tomorrow? Or next week? Someday, I will go to Greece. Someday, I will call my friend. Someday, I will clean out all the cabinets, put the photos in an album, and organize our music. Someday, I will read all the classic novels on my list. Someday, I will build wells and feed hungry children. Someday, I will fight for better gun control laws. Someday, I will write a book, lead retreats, open a counseling practice. Tomorrow, next week or someday is definitely when all those things will happen. Someday is seductive. Someday allows me to hold on to the vision I have of myself, the kind of person who I’ve always wanted to be…the person I’ve always known I am…the person who embodies the values that I say I have. I am courageous and adventurous, well traveled and well read, generous and thoughtful, organized and efficient, respected and successful. Or at least I will be…someday. Someday keeps my dreams alive. 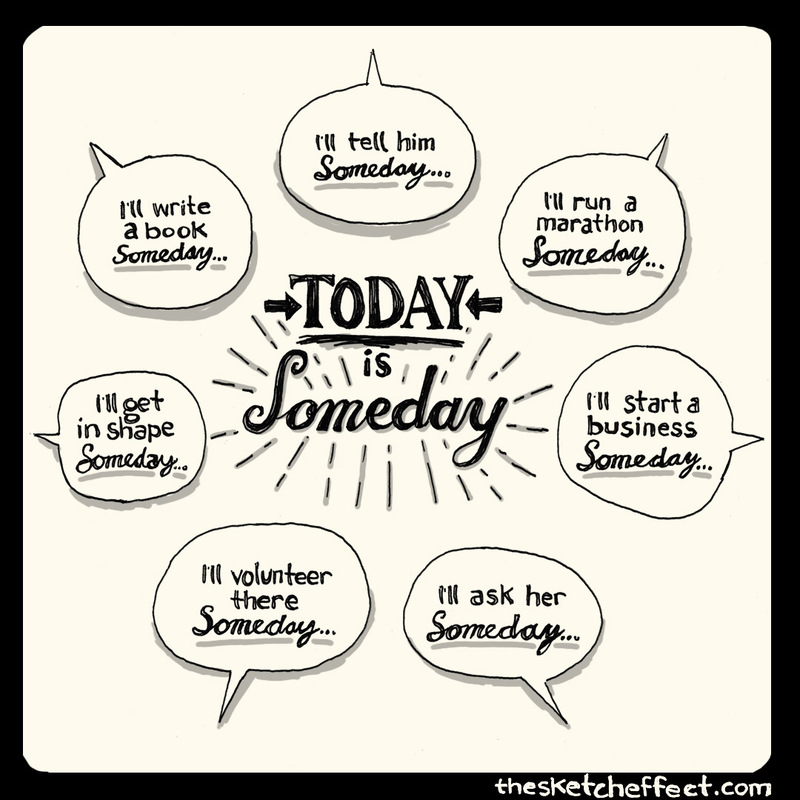 Someday is rich with promise and possibility, but does not require immediate attention. Someday allows one more episode of Netflix, another half hour of Facebook surfing or another season of prayer for discernment and clarity. Someday is comfortable and safe. Someday lets me off the hook. Someday isn’t all bad. When my kids were babies, we had no money and I was barely getting through the day, I worshiped at the altar of Someday. Someday kept me sane. Someday, they will sleep through the night. Someday, they will both be potty trained. Someday, they will feed themselves and teach themselves and drive themselves. Someday, I will go to the bathroom by myself. Someday I will have 5 minutes to myself again. And in this case, thank God, Someday did eventually arrive! But what if Someday never comes? What if Someday turns into If Only or What If? What is Someday is really just fear? I recently heard a speaker I admire say that “Someday is a myth.” When I heard those words, I felt sucker punched by the betrayal. But what about all my lovely Someday dreams? Turns out, we are not guaranteed Someday. Since I turned 50 last summer, the ambiguity of Someday is beginning to feel a little more like giving up and selling out. Someday is getting in the way of me finding my brave. I think my Someday is becoming Now or Never. Would you join me in banning the word Someday from our vocabulary? Or at least seriously evaluating its use? If that Someday thing was only available now or never, which would I choose? Is it really something I want to do or something I think I OUGHT to do? If it is important to me now, why wait until Someday to make it happen? If it isn’t possible now, what steps could I take to move closer to making it a reality soon? What is getting in the way? What obstacles, habits, excuses, rationalizations or denial do I need to kick to the curb? Is there anything in your life living in the distant cloud of Someday? What is keeping you from working toward it and making it a reality now? Now that I’m 52, I try not to dabble in somedays or maybes any more. Indeed, the myth of someday leaves us going nowhere. Fabulous post and insight. Thank you for sharing. This sooo applies to me too. There’s “Someday” and there’s also that “Next time”. Just this morning, I felt I missed an opportunity to pray with someone over a very difficult issue. After I hung up the phone and realized what I didn’t do, I told myself “Next time, I’ll do that. Next time, I’ll offer to pray with them. Right then and there. No “I’ll pray for you”, which so often means I either throw up a very quick prayer and move on, or I forget about it completely. But this morning, I listened to the Spirit’s prompting that said, “No, you have to do it now.” And that’s just what I did and I think we were both blessed by it. Here’s to listening to the prompting of the Holy Spirit and doing things now, rather than next time or someday. Ooooh! Next time IS so seductive as well! So proud of you for refusing to fall for it this time! The Holy Spirit so often says NOW…praying that we will listen and be brave! Thanks for sharing your encouraging story and for stopping by! When we sort through our somedays and put them on our calendar, they become “that day.” I love the wisdom and heart and honesty in this! I’m so grateful you joined me in #livefreeThursday! Thank you, Suzie, for your encouragement! I just recently put one of my big “somedays” on the calendar and it is indeed a moment of freedom and victory. Thanks for #livefreeThursdays….I love this community!! Thank you for your encouraging words, Crystal! I ‘m so happy you found them meaningful! Love this community….thank you for your leadership! !